WesTrac offer the full range of Augers that Caterpillar have built to suit its line of Skid Steer and Multi Terrain Loaders. Designed and built to strict Caterpillar standards, they carry with them the proven Caterpillar reputation for performance, versatility and reliability. These Augers are matched specifically to the machines’ auxiliary hydraulic circuit and horsepower for maximum system performance and reliability. The A14B Augers are a direct drive bi-directional Auger that provides the best performance in light to moderate duty applications and offer Auger bits up to 762mm (30 in) in diameter. The A19B are planetary-driven Augers designed to work with standard flow machine auxiliary hydraulics, and provides the best in moderate to heavy duty applications with Auger bits up to 914mm (36 in) in diameter. An A26B is also available which is the same size as the A19B and also planetary-driven, but offers lower speed and exceptional high torque output capabilities making it ideal for heavy duty applications. WesTrac offers both standard and tree Auger bits for a wide array of hole drilling requirements. In addition a variety of bit teeth made of hardened steel are also available for different soil conditions. An exclusive Cat mounting bracket is common to all Cat Auger deigns. 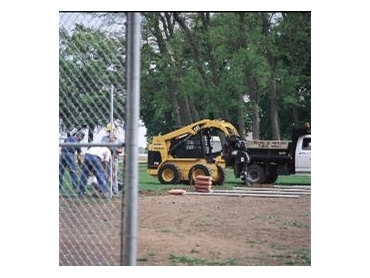 This feature provides solid structural reinforcement, positioning flexibility, easy transportation, near-vertical storage, easy work tool engagement and mounting versatility on backhoe loaders and mini hydraulic excavators.